Finding something that is uniquely them is always the best plan. A gift that clearly has a lot of thought and effort put into it will always be appreciated, but sometimes the best gift a person can get isn't personalized or customized for them; it's just a gift that they've been wanting and wouldn't buy for themselves. So if your husband misses the video game days of his childhood, don't overthink it – get him the gaming system. If she's needing a break from the hassles of the daily routine, get her the massage – or perhaps a luxury spa treatment. But if there aren't any glaringly obvious gifts your spouse needs or wants, you'll have to search a bit deeper. Sometimes the answer to this dilemma is to find a gift anyone would love and customize it especially for your spouse. Other times, the answer is just to remind your significant other that, no matter how long you've been together, you're still head over heels in love. After considering our tips, you may have the perfect gift for your spouse already in mind. However, if you're still looking for inspiration, we've listed five sensational ideas that might just be the perfect fit. Even if they don't quite hit the mark, these gift ideas might inspire you to come up with a fantastic anniversary gift idea of your own that's sure to wow your beloved. The Love Book is the perfect way to retell your love story and let your significant other know how you feel by revealing your perspective on all the best moments of your relationship. You can write in whatever you want, or follow suggestions and prompts to get your creativity (and precious memories) flowing. 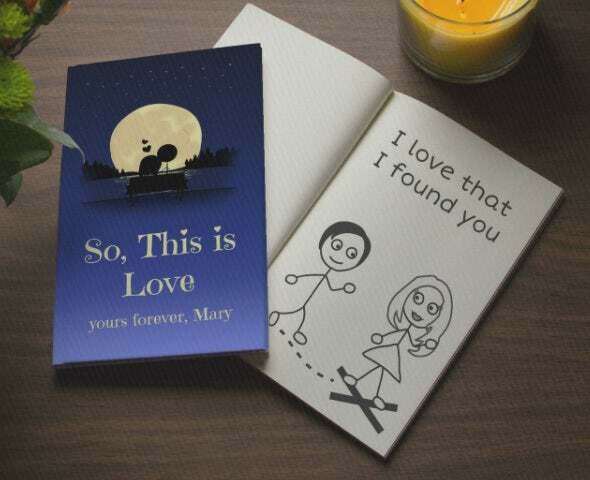 They have hundreds of ideas and illustrations that you can choose from to make sure the book tells your unique love story, and it's a gift that your spouse will cherish forever. You can get this book for under $50 and you'll have unlimited pages; which will probably come in handy, believe it or not. Because once you start recalling the years you've spent together, the more you'll want to include. You can choose to publish it in soft cover or hard cover, but we recommend the hard cover. At only a $5 difference, it's worth it for the extra durability. You'll want this book to last as long as your marriage: 'til death do you part. This is a personalized gift that will be a heartwarming look at your life with your spouse and at the houses that became homes. You'll send the artist pictures of your home(s) and she'll create illustrated renditions of each picture. You can send pictures of your first apartment together, each of your childhood homes, the venue where you were married; it's entirely your choice. 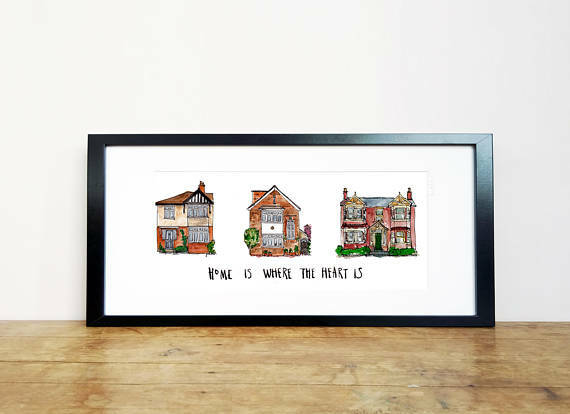 This is a gift that may be best for the couples that have been together longer and have perhaps shared a few different homes together, but it's also ideal for anyone wanting to commemorate the first home you've shared together as a family. The price, starting at approximately $90, increases with the number of homes included (up to six) and a frame, up to $300+ (or you can opt to frame it yourself). If you're looking for a creative, meaningful gift idea, this is sure to hit the mark. 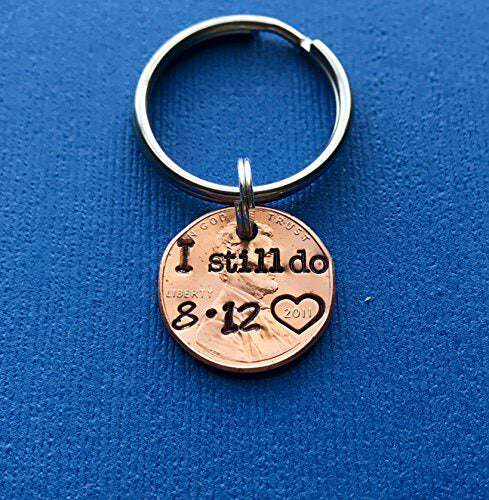 This keychain serves as a constant reminder that, no matter how long you've been married, you will always take your vows seriously and that you still do and always will take them for better or worse. Simple in design at a reasonable cost (under $10), this is a great gift for a couple just starting out or a couple whose anniversary has come around so many times that it's becoming a real challenge to find something unique yet heartfelt without going overboard. The penny itself is chosen to coincide with the year you were married. As you can see in the picture, the year of the penny's manufacture is circled and emphasized with a heart, just after the month and date of your anniversary. This gift is an especially thoughtful one for the couple who loves to travel, whether you're newly married or have already seen the world together. A map of the world on which you can pin your past, present, and future adventures. Even if you've been married just a year or two, giving this gift with your honeymoon destination already pinned – with the idea that you'll be placing many more pins to commemorate your adventures for many years to come – means this is definitely not a gift that will end up in a dusty corner. You can even use this as your hopes and dreams board, pinning your bucket list of "one day" travels. 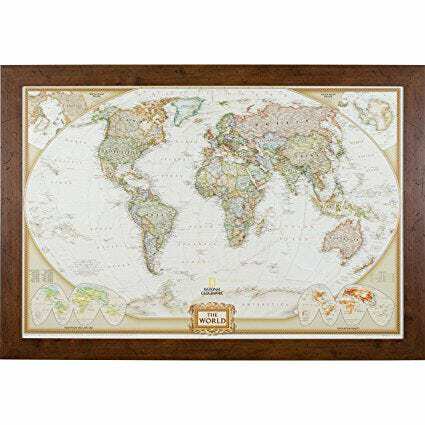 Each map comes with 100 pushpins and is framed in your choice of one of 18 different wood finishes. The framed print is 27.5 inches by 39.5 inches and perfect for hanging in your office or living room to relive your adventures and plan for the rest of your lives. Every love story is different, and every night sky is a bit different, too. 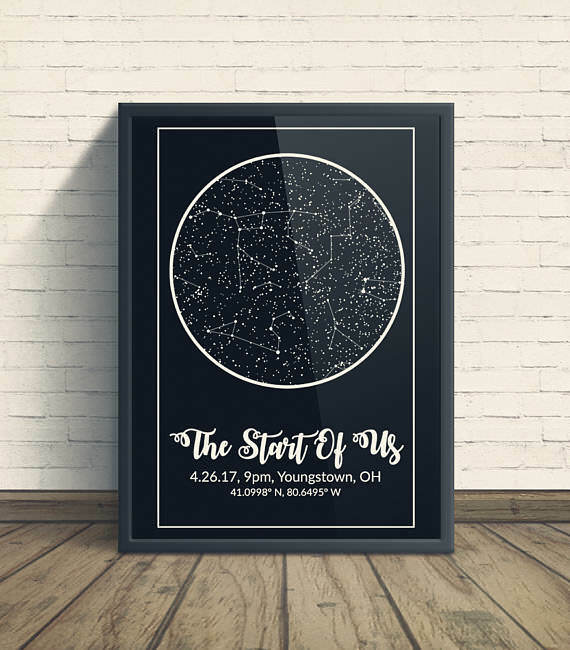 The beauty of this gift is that it uses astronomy software to pull a picture of the night sky for the date and specific location you provide – the night you met, your first date, the night you got engaged, your wedding date, or whatever date has the most meaning for you. The inscription reads, "The Start of Us," marking the beginning of your lives together. You can have the poster framed or not, and it comes in five sizes ranging from 8"x10" to 24"x36" and increases in price from $25 to $180 accordingly. The date, time, names, and longitude/latitude are recorded on the poster. And just to help you see exactly what you're looking at, they've also highlighted key constellations. Your marriage is something you celebrate in your own way each and every day. The opportunity to make your spouse feel special is there every day. But once a year, you get to celebrate the day you committed to spending the rest of your lives together, and getting the right gift for your spouse is a wonderful way to make sure they know exactly how much you appreciate the life you share.